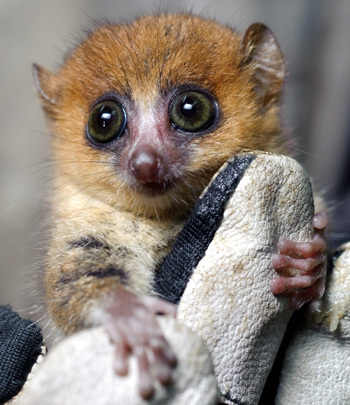 Like all lemurs, mouse lemurs are indigenous to Madagascar. It feels like an elementary school field trip rather than a film ready for nationwide IMAX distribution. It’s tough to tell if that’s because it was so expensive to film with IMAX cameras, or because that’s as much of a story as is warranted by this adorable arboreal primate who is getting marketed as “nature’s greatest explorer”. Either way, it’s an incomplete project that only starts to touch the surface of elements it needed to be a full body of work. It’s just enough for the kiddies to enjoy a few moments of cuteness and education, and for adults, we’ll learn a thing or three, too. For example, lemurs feature a pointed snout and typically a long tail, and they are found only in Madagascar. But in a day and age when we have comprehensive nature projects like the TV series “Planet Earth” and the 2012 Disneynature film “Chimpanzee,” “Island of Lemurs: Madagascar” feels like it was rushed and it ran out of money. It should have spent more time – even if that meant not being entirely in IMAX or shooting with IMAX cameras at all – to develop a full story, a human character and most important a central lemur or two by name. We do start to get to know Dr. Patricia Wright and her search for a particular endangered variant of lemur that she thought might have gone extinct. We can enjoy her peacefulness with them, adoration of them and maternal instinct for them. 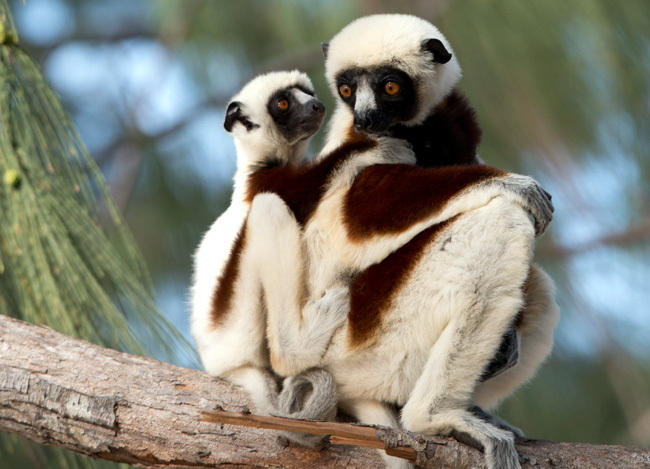 This family of Coquerel’s Sifaka lemurs are among the many lemurs listed as endangered. While we get to know groups of lemurs and there’s brief mention about a brotherly duo, the film makes the mistake of not honing in on at least one lemur by name. That’s what audiences – especially kids – connect to when we’re being told animal stories. Though the film highlights the tireless efforts of this trailblazing scientist and her lifelong mission to help these strange creatures survive in the modern world, there’s only enough screen time with her for you to feel her intrigue in them but not her love for them. Though just barely construed in the film, Dr. Wright has been successful in creating a safe haven for lemurs. For some additional meat to this story, I had to turn to the film’s press notes because the film didn’t have time to show it. In Madagascar, lemurs are such on the brink of extinction that scientists must proactively help them survive. Dr. Wright trekked to Madagascar for the first time in 1986 and observed that the native slash-and-burn agriculture was destroying their rainforest habitat. Working closely with the Malagasy people, she drummed up support for and raised the necessary money to establish Ranomafana National Park. Inaugurated in 1991, the park provides 112,000 acres of protected rainforest where lemurs can live in peace as they did when they first arrived in Madagascar. 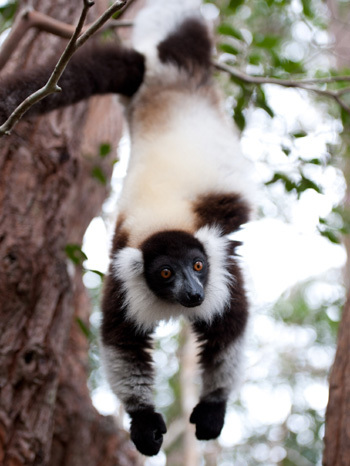 The park is one of today’s jewels in Madagascar and is home to 15 species of lemurs. Morgan Freeman had never been to Madagascar before, but was concerned with the lemurs’ plight and eager to be involved. While his recognizable voice lends credibility to the project and is pleasant to the ear, there also isn’t time to believe he really cares about lemurs any more than anything else he’s passionate about in life. It feels like he’s passionate for film, but not necessarily lemurs. Also, this film didn’t need to be shot in IMAX. It feels like that perhaps was the reason why it was too short and too incomplete. 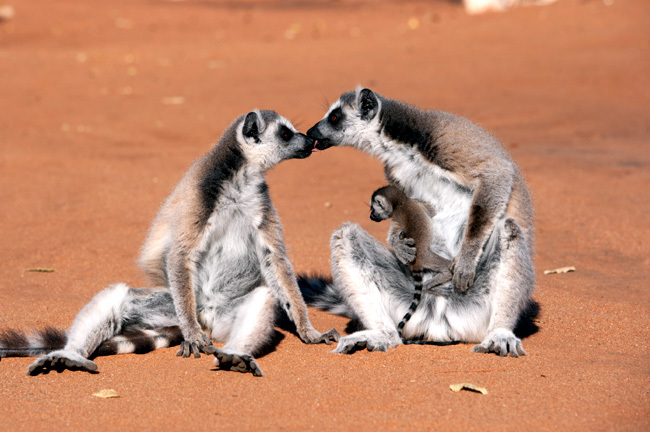 Ring-tailed lemurs spend more time on the ground than any other lemur. While the IMAX imagery is beautiful and bold, perhaps the economics of it held the film back as a whole. But ultimately, while the film is most successful at winning you over with the “cute factor,” it fails to make you want to lobby for it when there are so many other crusades elsewhere in life to get behind. The film reunites Morgan Freeman with Drew Fellman (who also wrote and produced the 2011 IMAX 3D documentary “Born to Be Wild 3D”) and director and cinematographer David Douglas (who was the director of photography on that film). “Island of Lemurs: Madagascar” is narrated by Morgan Freeman, directed by David Douglas, written and produced by Drew Fellman and stars Patricia Wright and Hantanirina Rasamimanana. The film was released in IMAX 3D and 2D on April 4, 2014. It is rated “G”.